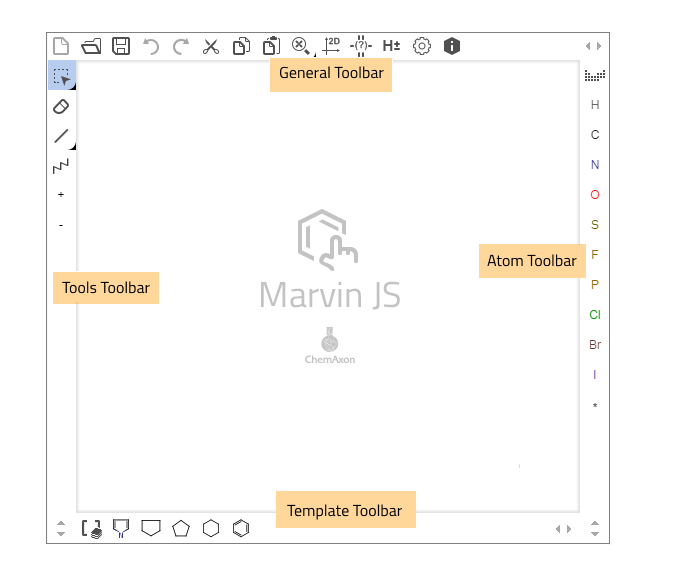 Toolbars provide buttons for accessing the majority of the features offered by Marvin JS. * The button of the currently selected tool has a blue highlight indicating its active status. In Marvin JS when you hover over a button a tooltip appears describing its functionality. General Toolbar JS consists of tools with scope of the whole canvas. This means that when you use these buttons it applies for every object on the canvas. (There are three exceptions, where the change will apply for the selected structure-part if there is one: Zoom to selection, Clean 2D, Explicit Hydrogen.) Generally the web service dependent features are also available from here. On Tools Toolbar you can find every tool to draw. Template Toolbar contains predefined structures, building elements. On the Atom Toolbar you can find the atom types (such as query atoms, elements of the Periodic system, frequently used atoms). *Please consider that the layout of the toolbars can vary depending on custom settings.